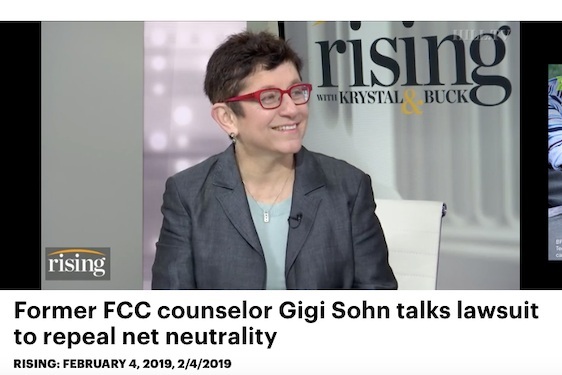 Our Institute Fellow Gigi Sohn appeared today on Hill TV to discuss Friday’s oral argument in Mozilla Corp. v. FCC, a lawsuit challenging the FCC’s repeal of the 2015 Open Internet Order. Sohn, a leading consumer advocate on communications issues, has long advocated for strong net neutrality protections to safeguard consumer interests and promote competition. She played an active role crafting the 2015 Open Internet Order as a Senior Counsellor at the FCC. “Chairman Pai… not only repealed the rules. He repealed the power that the FCC has to protect consumers and competition, and to promote competition. Consumer advocates have also argued that the FCC’s 2017 repeal of the Order was “arbitrary and capricious”, since it reversed a decision by the same agency less than two years before. Sohn attended the 5-hour oral argument on Friday, as did a number of Georgetown Law students who have engaged on these issues through Georgetown’s IPR Tech and Communications Clinic. You can follow her work on net neutrality and other communications policy questions at www.gigisohn.com.